In this course you will find general classes for stretching out your hamstrings and lower back, opening areas of your body which typically get compressed during sporting activity and classes to help you build strength. We have included some specialised classes for cycling and skiing. We recognise that sometimes the challenge is as much mental as physical and our fabulous Relax Into the Big Day class will help you get the rest you need as you prepare for a big sporting event. Not every class in this course will be right for what you need now, so we suggest that you tune into your body and see which areas could do with some extra support and then pick the class best suited to your needs. If you’re not sure our general overall stretch and recovery or strengthening classes will leave you feeling energised and relaxed. If you are looking to heal from an injury we recommend that you take professional medical advice and see a physiotherapist first. Yoga has multiple benefits for athletes including the prevention of injury. Focussing on balance can help prevent injury but is also great mental preparation as it builds focus. Yoga can also support you in building stamina through its emphasis on breathing. Better breathing will allow you to increase your athletic performance as you will using your breath more efficiently. Yoga will also help you to gain deep core strength. Some athletes find it difficult to hold a plank which is a shape that yogis are familiar with. By building your deep core strength you will see a corresponding effect on your stability. Speaking of stability, yoga will help your joints remain mobile and stable, keeping them safe during athletic activity. We’d love to hear how yoga complements your favourite sport. Do drop us a line and let us know in our Movers group. This is the third class in the Intelligent Body series, designed for beginners, athletes or those who work at a desk. 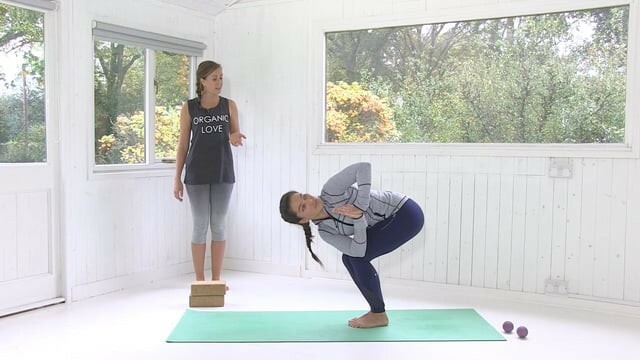 This class gives some alignment-focused poses to open up and strengthen the front body through plenty of shoulder-opening poses and backbends. A great class after a day slumped ove the desk! You will need to be close to a wall, have a couple of blocks, a strap and a blanket handy. The second part in the Intelligent Body series, especially for beginners, athletes or those who work at a desk. The importance of stretching, lengthening and releasing the side body is often neglected, but these stretches are integral to the health of the spine, shoulders and hips. A wonderful way to release after a long day. This short yoga class takes place supine, so it is great for those recovering from injuries or for after a really long walk, run or cycle-ride. Also great for after a long day at the office or for after travel to ease your hips back to health. Plenty of very accessible stretches to take the strain out of hips which tighten from exercise or from sitting still for a really long time. Thanks to Wellicious for their beautiful clothes! A short yoga class to give you mobility in your joints. Perfect if you're recovering from a bout of illness and want to ease yourself back into movement, or if you're recovering from a big work or running marathon. Thanks to Wellicious for their beautiful clothes! Lucy gives us some wonderful simple stretches for the backs of the legs, hamstrings, hips, shoulders and lower back - areas which can tighten up with a lot of cycling. With stretched muscles, you'll find you can go so much further...Try these stretches if you're a regular cyclist, if you're preparing for a cycling holiday or after a big ride. Props: Strap or belt. This short beginner-level class focuses on the quads which can get really tight after a lot of cycling. You will need access to a wall for some really deep quad-stretching. This practice will also be useful for many sports which requires strength of quads, including running, ski-ing, horse-riding and many games such as football, rugby and even tennis. A short, sweet practice to do just before you hit the slopes to prepare the body for skiing. Warming up the legs, heating the thighs and opening the shoulders. Featuring olympic skier Anais Caradeux. You'll need 2 blocks or large books. The perfect yoga practice to prepare you for the slopes. Focusing on building strength around the ankles, knees and thighs. You'll need a block (or a book) and a tennis ball. This class features French Olympic Skier Anais Caradeux as Lucy's student. Your thighs will feel this one! The perfect practice to prepare you for the slopes. Focusing on building core strength, balance and shoulder opening, this short class will have you supple, stronger and ready to go. The perfect practice to prepare you for the slopes. Focusing on building strength in the legs, opening the hips and feet. You may need 2 blocks. A short, warm down sequence after a day on the slopes to help lengthen muscles, release tension and boost recovery so you are ready for the slopes again tomorrow! This class focuses on stretching out the thighs, feet and shoulders.